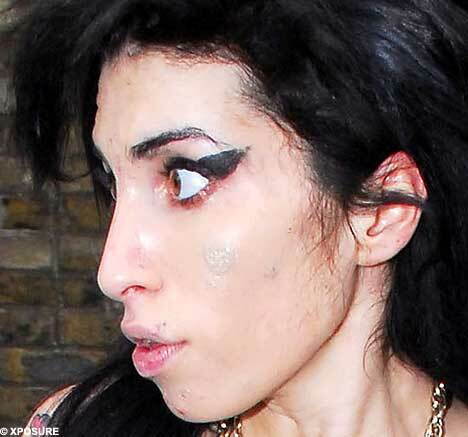 Not even a hefty slather of make-up can hide the shocking state of Amy Winehouse's skin. The singer was seen leaving her Camden home with the two-pence coin-sized rash on her face, which her spokesperson previously described as 'impetigo'. 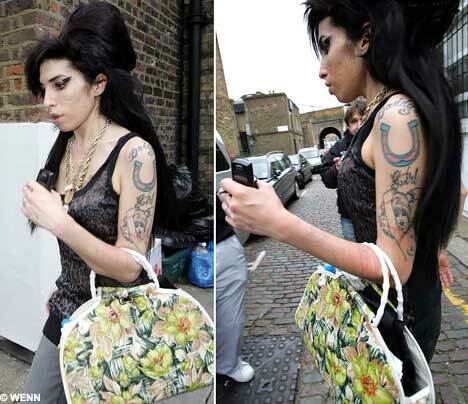 Amy's skin looks shockingly blemished and scabby, raising concerns about her health. And in general, Amy's health appears to have deteriorated since her comeback Grammys performance, with her once healthy-looking skin now appears scabby, and blemished. But even a tan would not be able to hide the fresh scratches which were evident on her arm, which raises more fears about the singer's well-being, and whether she may be self-harming. Fresh cuts: The marks on Amy's arm will cause concern that the singer has started self-harming again. She has admitted cuttting herself before as a child. A close friend confirmed the health scare adding that Amy had "suffered some form of skin infection—maybe an allergic reaction." And her spokesman insisted: "Amy has been diagnosed with impetigo which she's been told can be highly contagious. Record bosses are said to be set to order her back to rehab after being reported to be back on drugs again. "Because of that she's been put on antibiotics and may have to stay home alone for the next few days." However, Amy has not stayed home, and has been seen out a number of times partying with pals Kelly Osbourne and Mark Ronson. But she walked out just two weeks later to perform via satellite-link at the Grammys, where she won five awards. A source said recently: "All the optimism after the Grammys has gone. Amy is sliding towards oblivion." Meanwhile Rolling Stone Keith Richards has revealed the only modern pop star he rates is troubled Amy. Amy has gone back to her partying ways and even rocker Keith Richards has warned she should get smart quick. Amy was ordered to rehab in January after a video showed her smoking deadly crack while high on cocaine, ecstasy and Valium. 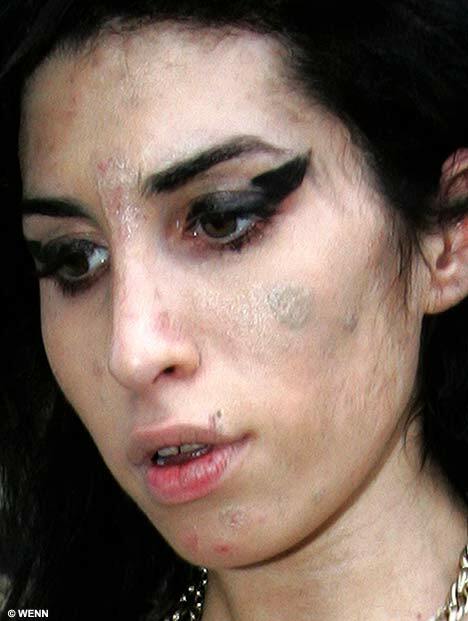 Blemished: Amy is still suffering from impetigo according to her spokesperson. Her skin appears scabbed and blemished. 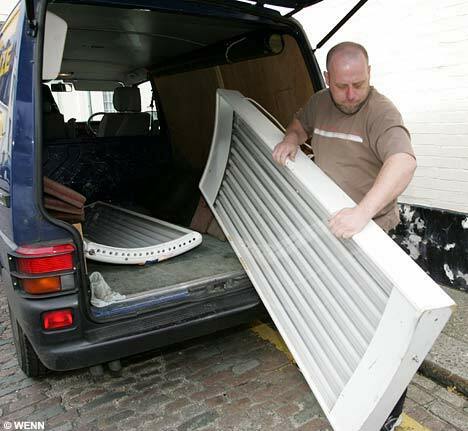 But the guitarist - famous for his huge consumption of illegal drugs - warned that Amy "wouldn't be around for long" unless she cleaned up her act. The Stones' lead singer Mick Jagger also said Winehouse's music would suffer because of the time she spent dealing with the authorities over drugs. Asked which modern artists he rated, he told The Mail on Sunday's Live! magazine: "There's only one person. That girl Amy. "Mind you, that girl isn't going to be around long unless she sorts herself out pretty quick. Amy's got to get smart." But wise Richards, 64, said he did not expect her to listen. He said: "I'm not a preacher. But I've been there and you have to pass it on." Last edited by CherryDarling; March 17th, 2008 at 11:03 PM. It looks almost like lesions. i guess faded tattoos from the tanning bed is the least of her issues right now. her face is just... no words. ick..
Gawd, her face looks terrible! I'm wondering if she may be the HIV+ singer...those look like lesions to me. She's going to die soon. How sad. So much talent, such a waste. She's just so damn disgusting. I'm just waiting for her OD. She's such a mess. Maybe the UV light helps with impetigo? Why does she show off her arms if she's been cutting? She's always in a tank top, no matter the weather. Is it a transparent cry for attention? I thought cutters wanted to hide their cuts? I'm so glad you said it first. That's what they look like to me too. I agree....impetigo is rash-like and looks like a rash. That is not a rash. It also looks like she put a cig out on her face maybe. So sad.